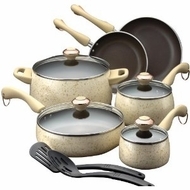 The Paula Deen Porcelain 12-Piece set has a durable exterior that is stain resistant and unique with it's speckled finish. The Silicone handles are dual riveted and comfortable with tempered glass lids. The heavy gauge construction is perfect for quick even heating and nonstick interior and porcelain exterior makes for an easy clean up.